In Australia, as in the United States and many other countries, copyright protections last for an awfully long time. Films and their contents, like other creative works, are protected for the life of the creator, plus 70 years. If a group of people created the work, it is copyright-protected for 125 years. The legal and philosophical rationales for copyright make a nonsense of those stipulations, even though disagreements reign over how to put into practice copyright’s supposed purpose: to encourage innovation and creation. Agreed is that copyright should prevent people from helping themselves to, and profiting from, other peoples’ creations. Wholesale “theft” discourages creation, even if financial profit often does not motivate it. But, do creators need such protection for many decades, rather than just one or two, to remain keen on creating something, now? Do they need their heirs to receive royalty payments, for many decades more? “Creators” often means companies that produce and market films, television programs, and the like, or companies that have acquired copyrights as investments. In either case, those companies would like to reap income from that ownership – to obtain “rent” from it, in a sense — for as long as possible. Who knows, a hit from 1950 might again become a hit, decades from now. Copyright law doesn’t need to grant owners everything they want. Lawmakers also must consider: how much use and what kinds of use should later creators be able to make of copyrighted works, and how soon? A shifting matrix of crisscrossing interests quickly takes shape in lawmakers’ brains. That may lead them to hearken to the loudest lobbyists, or kick the conundrum over to international trade negotiators, such as those who hear from even more persuasive lobbyists and then agree to pacts like the US-Australia Free Trade Agreement, with those extraordinarily long copyright-protection lifespans. In Australia, the balance of copyright laws gets in the way of creativity and innovation, many observers believe. They would like to see changes in two broad areas — one that Australia has in common with many other countries, and a second that it shares with only some other countries. Many countries share those many decades of copyright protection. Critics charge that those overprivilege ownership and royalties at the expense of creation and innovation. They say that they effectively remove creative works from the cultures that gave rise to them. That’s a problem, because using, refashioning, being influenced by, or just alluding to existing works is “fundamental to the creative process,” argues Nicolas Suzor a senior lecturer in law at Queensland University of Technology. Creators in various fields borrow, quote, or react in various other ways to what has come before, to contribute something new. 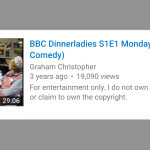 Of course, later creators are unlikely to want to use whole portions of original art works, unfiltered or unprocessed, but unless they pay original creators a license fee — if the original creators wish to allow even that — then the later creators can’t, say, riff off the earlier work: that would be to “steal” copyrighted material. Australia’s most infamous copyright case demonstrated that it may even be impermissible simply to echo an earlier work. In 2010, the band Men at Work lost a court case based on a claim that its 1979/1981 hit song, “Down Under,” snitched a children’s song written in 1934 for a Girl Guides jamboree, and well known in many countries, “Kookaburra Sits in the Old Gumtree.” The court found that the earlier song could be heard a flute interlude in the Men at Work song that was crucial to its appeal. Trevor Conomy’s 2015 book, Down Under, and Harry Hayes’s 2015 documentary film, You Better Take Cover, contended that the ruling punished artists for drawing from the culture around them. When a recording of the song first appeared, in 1980, it seemed obvious that the flute interlude alluded to “Kookaburra.” It wrily commented, as the song did, on the infantilism of men from “the land down under, where women glow and men chunder,” and “plunder.” But, years later, when the citation — as an echo, not a direct quotation — came to the attention of Larrikin Music Publishing, which had acquired the song’s copyright in 1990, it sued. 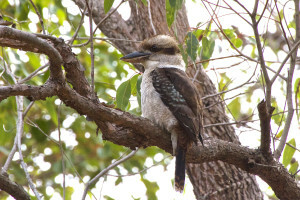 Men at Work staunchly, perhaps implausibly, denied any reference to “Kookaburra.” Until 2008, parody and satire were not copyright defenses in Australia. The court ruling enriched plenty of lawyers, but awarded Larrikin a mere five percent of the song’s royalties, from 2002 on — far less than the windfall it wanted. Men at Work fell foul, then, of a second key area of Australian copyright law: exceptions to copyright, and their limits. Exceptions to blanket copyright protection serve to tilt the balance from ownership, back towards fostering creativity. 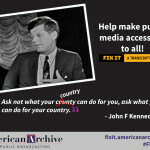 Examples include using portions of creative works, such as short snippets of films, in news reporting and arts reviews. How much, and how freely? Depends on where you are. In the U.S., the doctrine of “fair use” says: you can use as much as is reasonable, under the circumstances. It is a permissive doctrine, although of course, owners who wish to dispute “reasonable use” may make their case with a sharp or large legal stick. The Australian Copyright Act of 1968 is less permissive. Its concept of “fair dealing” allows for just a few prescriptive, restrictive categories exceptions to strict copyright. The effects of that include, for example, that if university doctoral candidates incorporate exemplary excerpts in their dissertations, such as snippets of film, they must either pay licensing fees that virtually no doctoral candidate or academic of any kind can afford, or remove excerpts before the dissertations can be placed in public repositories. Australian academics theoretically cannot even include small amounts of copyrighted content in conference papers, or share copies of copyrighted material among themselves, for purposes of discussion. Copyright, she notes, “is meant to stop an under-investment in creative works.” That has obvious dimensions, and arcane ones. The obvious include that films have economic value demonstrated by box-office and other sales, and filmmaking would be discouraged if films could be freely copied without payment. Of course, that principle, which seems largely lost public understanding of copyright, is disputed by creators, and their lawyers. They aren’t, for example, going to stand by and allow you to make, market, or use in your film your own Star Wars lightsabers. But at present, copyright protection extends for 125 years, or more, so that something created in, say, the 1930s still belongs to the heirs of the now-dead creator, and may generate income for them, but that “had no effect on the desire to create that, in 1930,” she suggests. These days, copyright-term extensions are written into international agreements, so are hard to change. But those agreements do allow signatories some wiggle room in creating exceptions — for example, in where to sit on the fair-dealing/fair-use spectrum. That is, in the short term, where Australia may be able to reform. Parliament didn’t act on those recommendations, but in 2006, influenced by US Digital Millennium Copyright Act, it made other changes, largely because the US-Australia Free Trade Agreement required them. It became illegal, for example, to circumvent various restrictions on access to copyrighted works; those include geoblocking technology, which prevents access in some parts of the world to some recorded content (such as DVDs) and online content. 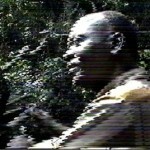 The changes also included a liberalization of private copying, so that it became legal to record television and radio programming and watch them later. This all demonstrates that in Australia, as elsewhere, lawmakers are grappling with slippery emerging technological issues. 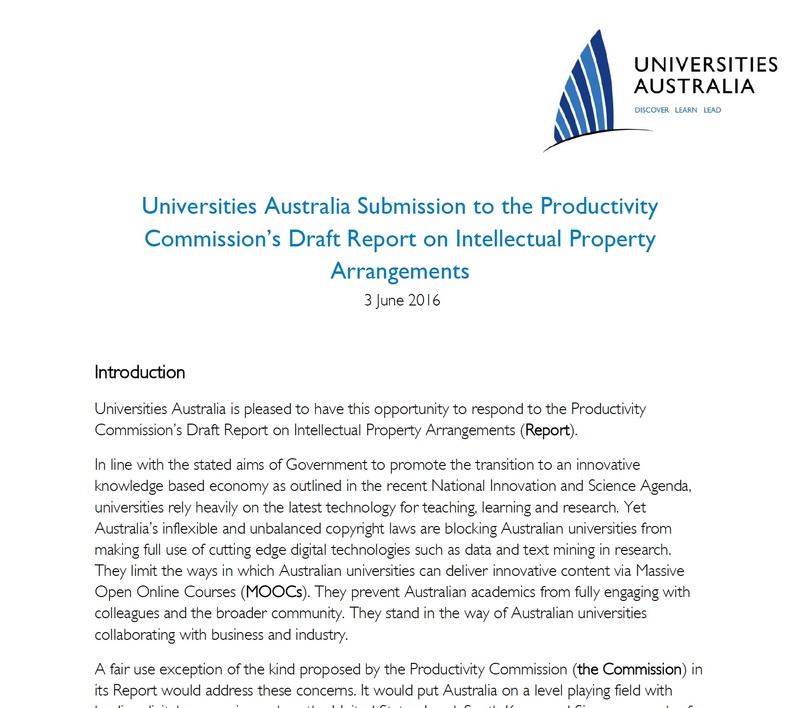 And it was into that context that late last year [20 December 2016] another independent, advisory organization, the Productivity Commission, handed the government the final report from its Inquiry into Australia’s Intellectual Property (IP) Arrangements. It examined Australia’s balance between promoting innovation and protecting the exclusivity of intellectual property. 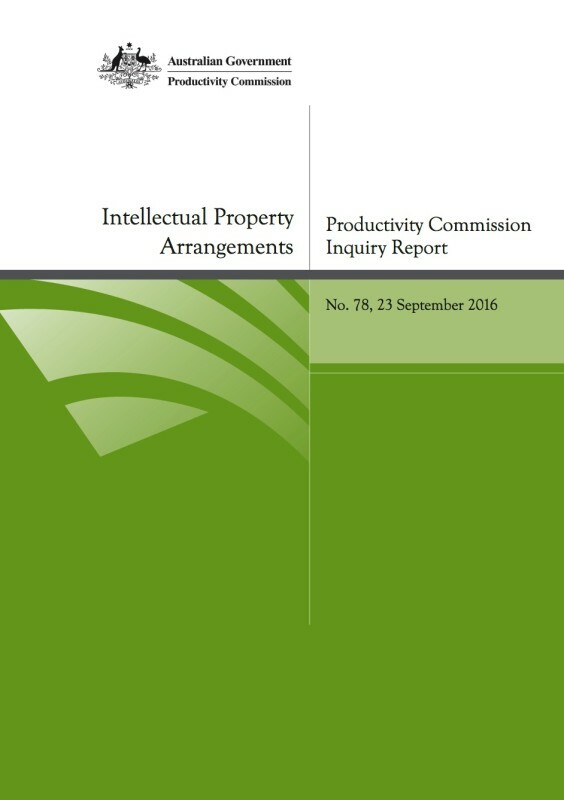 The Commission studied the economic and artistic outcomes of the existing regime, including laws regarding patents. 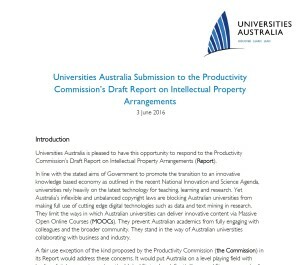 (Patents generate a related but whole other set of issues – the Productivity Commission’s report says current law, there too, is restrictive and grudging: it allows too many low-quality top-ups to existing patents, and that impedes subsequent innovation, and worsens the trade deficit.) Whether or not the country’s conservative, corporation-friendly Liberal/National Party coalition government acts on the Productivity Commission’s recommendations will be a matter of political courage. That’s ironic, because the Productivity Commission’s study was made as part of the government’s National Innovation and Science Agenda, whose flavour the Prime Minister, Malcolm Turnbull, has expressed with such statements as “we’ve got to be prepared to have a go and be more prepared to embrace risk and experimentation.” He has signalled that the government’s sense is that the current copyright approach impedes innovation — that it is “out of kilter” in favouring rights holders over users in ways that don’t align with how people actually use intellectual property, and that that impedes consumers of copyright material, as well as so-called follow-on creators. But opposition has been staunch, particularly from the major copyright-industry groups. They claim to be protecting the rights, and incomes, of copyright holders, even though under existing copyright arrangements, creative artists in Australia “get paid very little for their work, and legitimate consumers aren’t getting a very fair deal either,” as the Queensland University of Technology’s Nicolas Suzor has written. The universities would like such changes as the expansion of copyright “safe harbours” — think, YouTube and other online platforms that host posted material, but are shielded from responsibility for copyright-breaching postings — to include all online service providers, including universities. The Productivity Commission found that copyright law ill serves whole swathes of Australian society. It recommends, for example, that consumers should not be deemed to be breaching copyright law if they circumvent geoblocking technology, and that the Government avoid entering into any international agreements that would bar the use of software that circumvents geoblocking. That refers to such practices – ask any savvy teenager – as using VPN and other work-around technologies to access geoblocked online material. The Commission also calls, as the Australian Law Reform Commission earlier did, for limiting liability for using “orphan works” that later turn out to have a copyright owner. 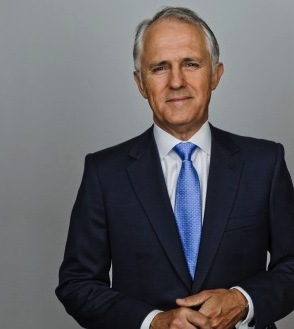 Prime Minister Malcolm Turnbull came to power in September 2015 on the strength of his claims, thenceforth often disparaged, that he was communications boffin. 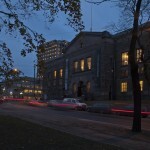 Photo: Office of the Prime Minister of Australia. The Commission says, more broadly, that the country’s copyright laws need to better reflect the way consumers access and use content in a digital world — sounds like what Prime Minister Turnbull said. At the same time, the Commission recommends maintaining balance by facilitating new ways of providing access to digitally stored data and content that would both reduce the need for enforcement and penalties, and reduce online copyright infringement. As a further balancing intervention, it recommends closer oversight of the way that copyright collecting societies distribute royalties to filmmakers, musicians, and other copyright holders. That seems a veiled allusion to creators’ complaints that most artists get pitiful royalties, no matter what. The recommendation of “fair use” rather than “fair dealing” seems likely to be the most energetically advocated by creators, universities, and the like, and resisted by the industry of law firms, lobbyists, and collecting agencies that has grown up around copyright in Australia, as in the U.S. and elsewhere.